SINGAPORE - Community clubs play a very special role in Singapore, as they are where residents meet, make friends and bond, Prime Minister Lee Hsien Loong said at the official opening of the upgraded Teck Ghee Community Club (CC) on Sunday (Jan 13). This is why CCs are found in every Housing Board estate, PM Lee added. "The Government invests heavily in building and upgrading the CCs so that residents will always have a place to call their second home," he said. Nearly 1,200 sq m of floor space was added to Teck Ghee CC, where new facilities include a rooftop terrace, an upgraded culinary studio and an expanded multi-purpose hall with a second-level viewing gallery. Taiji and wushu sessions will be held at the rooftop terrace, as will outdoor movie screenings and barbecue events. The 35-year-old CC in Ang Mo Kio, which used to have a gross floor area of 4,809 sq m, reopened in August last year, two years after it closed for renovation. "(Teck Ghee CC) has been a very popular and well-used CC, but we had more and more activities and needed more space. We didn't have enough space and we couldn't accommodate all the activities we wanted to start here," said Mr Lee, who is an MP for Ang Mo Kio GRC. The Government paid for 90 per cent of the upgrading costs, while the rest was raised by a committee formed to oversee this project, Mr Lee said at the event attended by more than 2,000 residents. 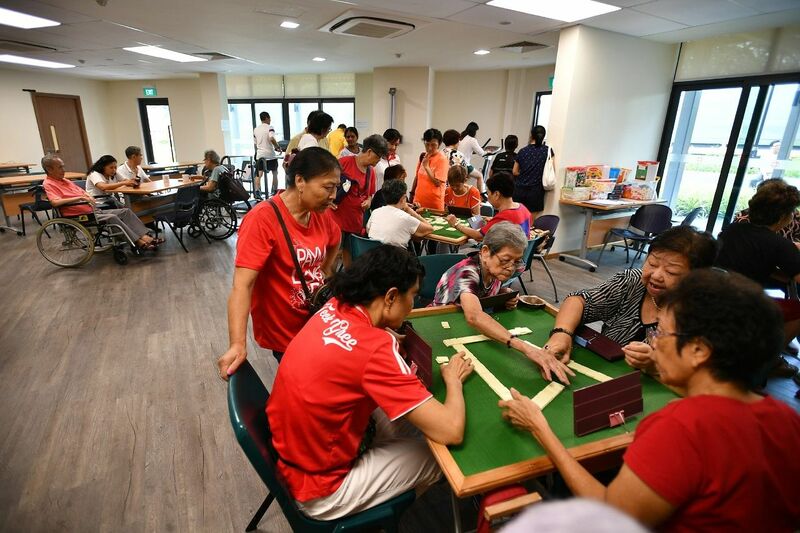 The People's Association manages the CCs and runs their programmes, said Mr Lee, and they work hard to make sure that the activities are up-to-date, regularly refreshed, and meet the changing demands and interests of residents. He was given a tour of the new facilities, including a cookie baking session by parents and their young children at the culinary studio. He also visited the refurbished wellness centre, which runs programmes such as "La Kopi" sessions that have provided free breakfast to the elderly from Mondays to Fridays since last November. Also at Sunday's event were Mr Lee's wife Ho Ching and six other MPs from Ang Mo Kio GRC and Sengkang West SMC, including Mr Darryl David and Dr Intan Azura Mokhtar. Retired production operator Suzie Ng, 72, who has lived in the Teck Ghee area for 23 years, welcomed the new facilities. Madam Ng, who uses a wheelchair, said she appreciated the fact that there are now two lifts instead of one before the upgrading. "The CC staff asked me to take part in today's inter-generational basketball shooting competition, and I did so although I haven't played basketball in 35 years," she said. Singapore Polytechnic student and music enthusiast Abdul Matiin Muhamad Hamim, who lives in Boon Lay, goes to Teck Ghee CC a few times a month to practise with fellow musicians. "The new CC is a quiet and good environment to practise, and the architecture is beautiful too," said the 18-year-old, who plays the drums.